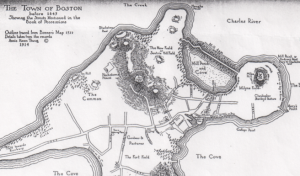 Francis Lovelace languished in the Tower of London in 1675, unaware he had created the Boston Post Road two years earlier and forever shaped New England. The first postrider started out sworn to obey Lovelace's instructions to behave civilly, to ask the governor of Connecticut how to form the best post road, and to mark the trees for the direction of passengers. Thus Francis Lovelace initiated both the U.S. Postal Service and the Boston Post Road. There are actually three Boston Post Roads, all of which merge in New Haven. The Upper Road, or the Old Boston Post Road, runs from Boston through Worcester, Springfield and Hartford. The Lower Road heads south from Boston through Dedham and Providence, then runs along the coast of the Long Island Sound. The Middle Road, less used than the others, leaves Boston through Dedham, Medway, Uxbridge, Douglas, Pomfret and Coventry to Hartford, then to New Haven through Wethersfield, Berlin, Meriden, Wallingford and North Haven. Much of the Post Road is now U.S. Route 1, U.S. Route 5, and U.S. Route 20. Though Francis Lovelace set out the guidelines for what would become the Boston Post Road, it was King Charles II’s idea. Charles had decided to seize the tiny colony of Niew Netherland and give it to his brother, the Duke of York. He sent four warships to the settlement and demanded the Dutch surrender. They did. Charles appointed (brother of the poet Robert Lovelace) royal governor. Charles wanted to knit his English colonies together more closely – especially since the Dutch just might try to recapture New York. Winthrop was the perfect person to help carry out such a plan. He had traveled the post road himself. In the earliest days of the New England colonies, towns were surrounded by wilderness. The only roads emanated from the meetinghouse. To the extent the towns were connected, they were connected by Indian trails – a foot-and-a-half wide in some places, across surging rivers in others. John Winthrop’s father, who always traveled with a match, a compass and a snakebite remedy, found it remarkable that someone had journeyed to Conneccticut alone in 1635 and returned safely. After about 1650, the colonists began to travel more frequently between towns. There were few horses in the first decades of the 17th century. As the equine population grew, New Englanders could ride longer distances. And as trade with the West Indies flourished, they drove their livestock from the interior to market on the coast. On Nov. 11, 1645, 39-year-old John Winthrop the Younger loaded his horse and set out from Boston on foot along what was then called ‘The Bay Path’ (later the Upper Boston Post Road). He intended to find a spot to start an ironworks along the Connecticut coast. He traveled through howling winds, heavy snow, driving rain and freezing temperatures. He slept on the ground, filling a net with grass for a blanket. He got lost several times, fell into a stream once and cut down a tree to cross another. 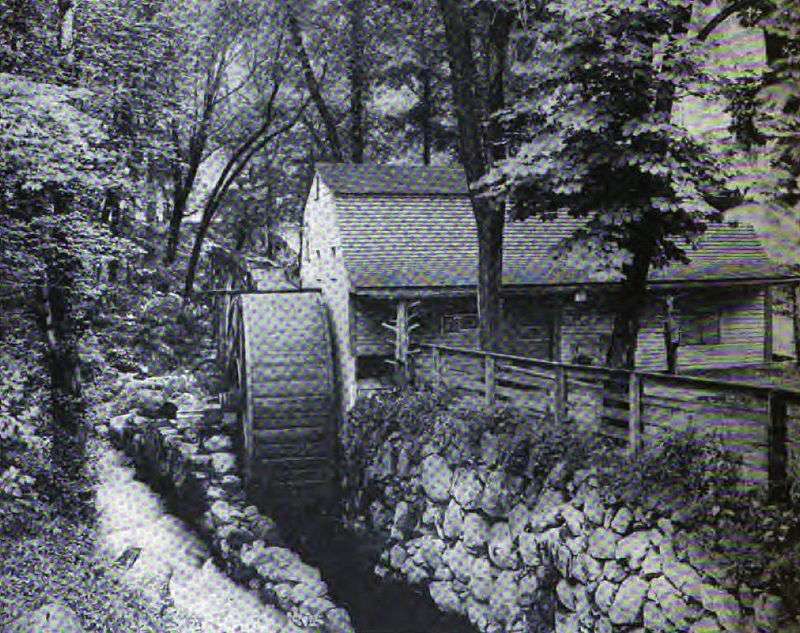 Gristmill built by John Winthrop the Younger in New London as it looked in the 20th century. John Winthrop the Younger moved his family to Conncecticut and became the state’s longest serving governor. Twenty-seven years later Winthrop received the letter from Lovelace. In those days, mail had been sent via Indian or shipmaster, servants, travelers and cattle drivers. Lovelace would pay him a handsome livelihood from his wages and charges for letters and small packages. Hartford was to be the first relay station for him to change his horse. On the first Monday of every month, the postrider was to leave New York and return from Boston within the month. The mail was to be in different ‘baggs, one for each town to which the mail would be delivered, sealed into they arrived, with the seal of the ‘Secretairie’s Office,’ who would affix it on Saturday night. Lovelace suggested that Winthrop talk to ‘some of the most able woodmen,’ to find the easiest way, which eventually would become the Boston Post Road. The first mail was to leave New York on January 1, 1673. Lovelace waited, though, to send Winthrop the latest rumors about a convoy of Dutch warships. The postrider left on Jan. 22, 1672/3. Boston as it looked during the first mail delivery. The postrider continued his monthly journey. In July of that year, Lovelace rode from New York to Hartford to discuss the postal service with Winthrop. They agreed, for example, the postrider should direct travelers, who could accompany him, to the best roads and inns. But while Gov. Lovelace was meeting with Gov. Winthrop in Hartford, a Dutch naval squadron appeared in New York Harbor. The city surrendered and Niew Amsterdam was returned to the Netherlands. Lovelace was sent back to England in disgrace. The Duke of York blamed Lovelace for the loss of the colony named after him. Lovelace owed him 7000 pounds, and York confiscated his estates. He was committed to the Tower of where he contracted dropsy and was released in April 1675. 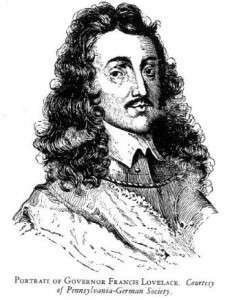 Francis Lovelace died broke on Dec. 22, 1675. The Dutch gave up New York in a little more than a year, but King Philip’s War broke out and temporarily ended the postal service. 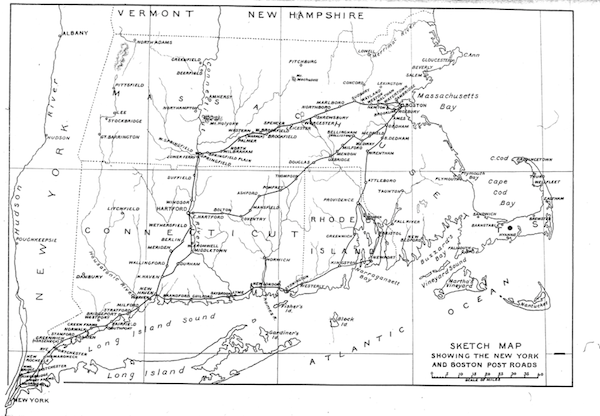 The challenges of riding from Boston to New York along the Boston Post Road were vividly described in the journal of Sarah Kemble Knight. With thanks to The King's Best Highway: The Lost History of the Boston Post Road, the Route That Made America by Eric Jaffe and The Old Post Road by Stewart H. Holbrook.